Dream Theater established themselves in the 90's as the premier force of progressive metal. 1992's Images and Words, their second album overall, was the album that put this band on the heavy metal map. It contained their highest charting single, 'Pull Me Under', an 8 minute progressive-thrash song that in their early days, drew some comparisons to Metallica. The rest of the album illustrated how truly versatile they were. 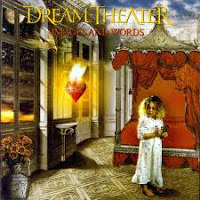 Images and Words was just the beginning for Dream Theater, but it remains one of their most memorable albums, as confirmed by your votes in the recent reader's poll. Dream Theater quickly became masters of grand thematic elements in the music and lyrics. 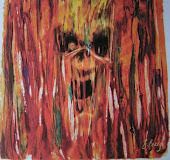 Now a trademark of the band, there were several 8 minute-plus songs on Images and Words. Songs that sometimes seemed to push the limit of musical intricacy. They contained a blend of heavy and melodic elements, with balanced instrumentation of guitars, keyboards and drums. Long instrumental segments of some songs were where you found the band jamming on a catchy chord progression, highlighted by multiple leads and solos that traded off from one instrument to the next. Then, just when you thought they've exhausted the musical potential of a given chord progression, they fell back into the song's chorus, or another verse, and brought the song to a conclusion. 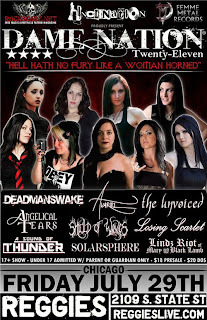 Don't Miss Deadmanswake at Dame Nation 2011!!! On Friday July 29th, don't miss the biggest Chicago event to feature independent, female-fronted heavy metal bands: Dame Nation at Reggie's Rock Club! Included on the bill is DEADMANSWAKE, current independent band-of-the-year here on Heavy Metal 107! Not to be overlooked, Losing Scarlet, last year's independent band poll-winner, are also performing. Don't miss the rare opportunity to see these featured bands perform together! Dame Nation has developed a reputation for gathering the best independent, local talent when it comes to female-fronted rock and metal bands. This year that reputation stands to grow even further, drawing a few out-of-state performers. Other bands appearing include: Avariel (from Boston, MA), The Unvoiced (from Montreal, Canada), Angelical Tears (from Oklahoma City, OK), A Sound of Thunder (from Washington D.C.), Lindz Riot of Mary and the Black Lamb (from Ontario, Canada), along with Shield of Wings, and Solarsphere (both from Chicago). It all starts at 5pm on Friday the 29th - less than a week away! Click the image below for more information and how to get your tickets! Every so often a CD comes around that I just can't get enough of. These are the albums that live in my CD player for months on end. You know this kind of album: the one that just grabs you and you can keep playing it over and over and never get tired of it. I've had this experience several times, when I'll listen to the same CD on a daily basis week after week. In the past it's happen with albums like GN'R's 'Appetite for Destruction', Pantera's 'Far Beyond Driven', System of a Down's 'Mezmerize'... Well, this summer it's happened to me again. 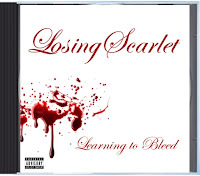 The album that did it this time: Learning to Bleed by Losing Scarlet. Losing Scarlet have held strong to their signature sound they established on their self-titled 2009 debut, but Learning to Bleed sounds like a much stronger, crisper, and more established effort. It's not that they've done anything different on this album, I just think they do what they do much better this time around. The recording quality seems a couple notches higher to my ears as well. As you listen to this album, it flows really well from one song to the next. Each song seems to add a slightly different element or effect to their repertoire. Scream The Prayer Tickets available... for Sunday July 17th! For anyone in the Milwaukee area; I have tickets available for THIS SUNDAY'S show: SCREAM THE PRAYER TOUR! 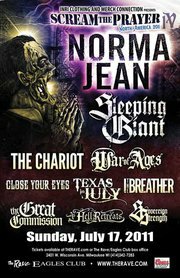 Headliner: NORMA JEAN. Also featuring: Sleeping Giant, The Chariot, Close Your Eyes, Texas in July, I the Breather, The Great Commission, As Hell Retreats, Sovereign Strength, AND St Louis' heroes of underground metal- STRYCH9HOLLOW (see posts #98 & #133), plus many more! Send an email to: happyheadbanger@gmail.com for more information! Hurry if you're interested! Only 3 days until the show! After the tragic death of their drummer, Jimmy 'The Rev' Sullivan, Avenged Sevenfold faced a tough decision of whether or not to continue their musical career. Having already written most of their next album, they decided, after taking some time off, to stick it out and continue on with A7X. As a fan, I was okay with their decision. I can't believe The Rev would have wanted them to give up making music. My curiosity was peaked as I anticipated this latest album. How would they finish it up? What would the mood be? Would there be tracks with The Rev's unique vocals, either as lead or background? What would they do to honor him? And most obvious, who would finish up the drum tracks for the album? All of these questions and more were answered with the release of Nightmare. The first answer I learned of, as I followed this project, was that Mike Portnoy, former drummer of Dream Theater, would be filling in on drums. This was at the band's request; Portnoy came to mind as he was The Rev's favorite drummer. Portnoy accepted the offer graciously and performed like a pro in the studio. This notion is just one of several ways the band honored The Rev in the production and release of this album. There is a 'thank-you' in the liner notes both to Jimmy and to his family. He is depicted in a drawing of 5 skeletons that represent the 5 band members, his tell-tale hair style making him easy to recognize. Another photo of the 4 remaining band members at a bar also includes an empty bar-stool with a full glass on the bar in front of it. The picture behind the CD is of the band embracing, with text below reading, "R.I.P JIMMY "THE REV" SULLIVAN, 02/09/81 - 12/28/09". There are vocals from The Rev recorded on this album in the song 'Fiction', and you can imagine many of the lyrics could be about The Rev, or how the band is trying to cope with their feelings of grief and mourning. Most obvious, however, has to be the lettering on the grave stone on the album's cover-art, which reads, "FOREVER". 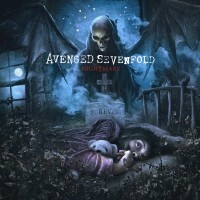 All the references to The Rev aside, Nightmare proves to be the most versatile album yet from Avenged Sevenfold. There are a few heavy songs, like the title track and 'Welcome To The Family', and also several softer tunes like 'So Far Away' and 'Fiction' that make liberal use of clean guitars or piano. Some tracks bring elements of progressive metal into the fold, much like they did to some extent on their last couple albums. The biggest surprise, to me, was hearing the song 'God Hates Us', which employs an extremely harsh, screaming vocal-style that hearkens back to the band's early years. It seems like they included this song to prove to their fans from those early years that they can still scream like that if they want to, however I believe M Shadows' history of vocal cord surgery is still a deterrent from using this style to excess. Avenged Sevenfold have always written songs with dark and haunting tones and themes, and Nightmare brings those moods out again. This time, though, it feels more personal. There is a definite somber mood in many of the songs. I am sure that in many ways recording this album was a catharsis for the band, helping them to deal with their emotions surrounding the loss of their band-mate and friend. No doubt there are a multitude of fans out there who have felt their own emotions brought to the surface while listening to this album too.